Version 4.0.0 has been superseded by the latest version of the Unicode Standard. Version 4.0.0 of the Unicode Standard consists of the core specification, The Unicode Standard, Version 4.0, the delta and archival code charts for this version, the Unicode Standard Annexes, and the Unicode Character Database (UCD). A complete specification of the contributory files for Unicode 4.0.0 is found on the page Components for Version 4.0.0. The text of The Unicode Standard, Version 4.0, as well as the delta and archival code charts, is available online via the navigation links on this page. These files may not be printed. The Unicode 4.0 Web Bookmarks page has links to all sections of the online text. 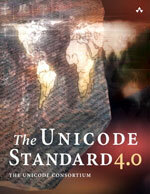 Unicode 4.0.0 is a major version of the Unicode Standard. The text of the standard has been extensively rewritten to improve its structure and clarity. substantial improvements to the script descriptions, particularly for Indic scripts and Khmer. 1,226 new character assignments were made to the Unicode Standard, Version 4.0 (over and above what was in Unicode 3.2). These additions include currency symbols, additional Latin and Cyrillic characters, the Limbu and Tai Le scripts; Yijing Hexagram symbols, Khmer symbols, Linear B syllables and ideograms, Cypriot, Ugaritic, and a new block of variation selectors (especially for future CJK variants). Double diacritic characters were added for dictionary use. These new characters extend the set of modern currency symbols, and represent a greater coverage of minority and historical scripts. The following table shows the allocation of code points in Unicode 4.0.0. For more information on the specific characters, see the file DerivedAge.txt in the Unicode Character Database. The character repertoire corresponds to ISO/IEC 10646:2003. For more details of character counts, see Appendix D, Changes from Unicode Version 3.0. Unicode Version 4.0.0 introduced the concept of provisional properties, clarified the relationships between properties, and provided precisely defined fallback properties for characters not explicitly defined in the data files. The documentation was coalesced into UCD.html, with a combined list of Properties. Prefix Format Control. U+06DD arabic end of ayah and U+070F syriac abbreviation mark were reclassified and have significantly different behavior as prefix format control characters. The new characters U+0600..U+0603 were given this behavior as well. New Properties. The Hangul Syllable Type and identifier Other_ID_Start properties were added. The Unicode Radical Stroke property was classified as informative; all other Unihan properties were classified as provisional. PropertyValueAliases also adds block names. Numeric Properties. CJK numeric values added; the properties Decimal Number (Nd) and the Numeric Type decimal digit were aligned in value. Modifier Letters. The General Category of U+02B9..U+02BA, U+02C6..U+02CF changed to General Category Lm. Grapheme_Extend. The halfwidth katakana marks, and most combining marks (except as needed for canonical equivalence) were removed. Mongolian Vowel Separator. U+180E mongolian vowel separator was changed to General Category Zs. Deprecated Characters. Two Khmer characters, U+17A3 khmer independent vowel qaq and U+17D3 khmer sign bathamasat, were deprecated. Four others are strongly discouraged. Enclosing combining marks. The scope has been defined more clearly. ZWJ. The semantics with cursive scripts has been revised. Normalization Corrections. There were corrections for characters U+2F868; U+2F874; U+2F91F; U+2F95F; U+2F9BF. Note: these corrections are in accord with the Unicode Character Encoding Stability Policy. For more information, see the file UCD.html in the Unicode Character Database. Chapter 3 was substantially improved by incorporating the Unicode Character Encoding Model, resulting in fully specified definitions and conformance requirements of UTF-8, UTF-16, and UTF-32. As a part of this, the related concept of Unicode String is defined, which is a sequence of code units for internal processing; a sequence that is not necessarily a valid Unicode Encoding Form. Identifiers. A structure for ensuring backwards-compatible programming language identifiers was introduced using the new property Other_ID_Start. There is also an alternate definition for complete stability of identifiers. Bidi. The bidi algorithm was updated and moved to UAX #9 (see below). Line Breaking and Boundaries. U+00AD soft hyphen was reclassified. Text boundaries were clarified. Now contains information on text boundary conditions formerly published in Chapter 5 of The Unicode Standard, Version 3.0. Now contains information on the bidirectional algorithm formerly published in Chapter 3 of The Unicode Standard, Version 3.0. Annex 12: Corrigenda was rewritten for clarity, and to describe the use of Normalization Corrections. Extended the range for the default property value to 30000–3FFFD. Added notes on the stability of Q names, the usage of Mn, Me characters, and scripts with regard to spoofing. Errata incorporated into Unicode 4.0 are listed by date in a separate table. For corrigenda and errata after the release of Unicode 4.0, see the list of current Updates and Errata.